Boom! Your home theater has been upgraded. BÖHM's new B2 is our 2nd-generation TV sound bar, and is sleeker, slimmer, prettier and more capable than our previous model. From spec'ing out your ultimate man cave to completing the family's spectacular home cinema experience, every great home theater needs a solid foundation of quality sound. 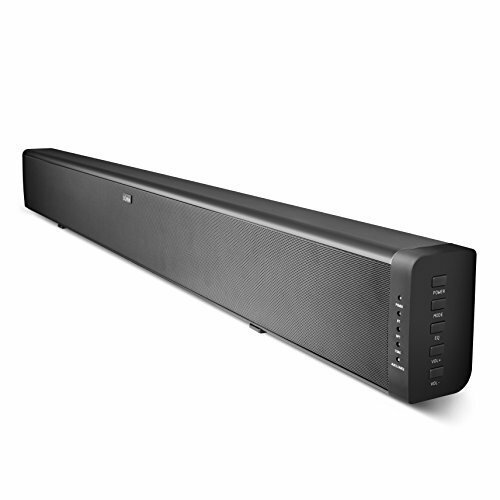 And our new 60-watt television sound bar brings together the best audio and connectivity technologies in one slim, stylish and beautifully compact package. Most impressive is the Hollywood sound quality. Just listen. There is nothing to configure, and no user manual to lose your hair over: Simply plug our B2 into your TV's audio output, and enjoy truly enveloping, immersive, expansive, virtual surround sound. Movie night just became a whole lot louder. The B2 uses spatial time delay to create room-filling virtual surround sound. And with Music, Movie, and TV preset listening modes built in, you can throw a party, transform your room into a theater, and wind down - all at the touch of a button. In each mode, you'll experience the thrill that accompanies 60 watts of pure, rich sound with an enhanced frequency response range of 20Hz - 20kHz. Despite the technological improvements, we've slimmed the B2 down to 3.94" x 39.4" x 2.55". To make this the ultimate sound bar for TVs and computers alike, the lightweight, intuitive remote puts an extended host of controls into the palm of your hand.Switch between the 3 listening modes, and control every other feature of the B2.